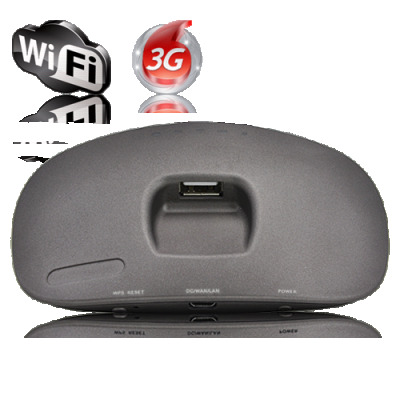 Successfully Added Dual Connection 3G + 802.11n Wireless Router with Internal Battery to your Shopping Cart. Enjoy true wireless freedom with the Dual Connection 3G + 802.11n Wireless Router. Instantly turn your home connection into a high speed 802.11n WiFi hotspot or share your 3G connection on the go with this ultra convenient router. -The Ultimate Travel Router: The small size makes it easy to take with you wherever you go; the built-in battery allows you to truly use it anywhere and allows for 3-5 hours of unplugged operation. -Ready for Anything: With support for both Ethernet and most popular USB mobile broadband adapters, you can share your Internet connection regardless of whether you are on the road, sitting at home, or experiencing a power outage. -Ultimate Security: The router’s built-in SPI firewall, with anti-DoS attack shield and NAT functions, provides protection from threats from the Internet or known networks. -Works Anywhere: Compatible with any 3G USB modem, any carrier, and in any country. Featuring 802.11n technology, this wireless router proves that good things come in small packages. With up to 3X faster speeds than 802.11g networks, you get faster speeds and more stable and reliable wireless connections when gaming, downloading, streaming multimedia, or just browsing the web. Enjoy a better Internet experience now - the 802.11n wireless experience. This device is also backwards compatible with existing 802.11b/g networks and devices. High cost-efficiency router is the best choice for mobile / small office / home office users, as all computers and network devices can share a single wireless. True portable, wireless freedom is available now. Brought to you by Chinavasion. Convenient wireless for your desktop computer, laptop, gaming device, phone, etc. Please note: 3G USB Modem and SIM card not included. Once you have connected it to it, visit the IP address given in the user manual. Everything is done through a web-based configuration/management interface. Very easy to install, I tested with different dongles (also Huawei E1750) and Nokia), and it is working just fine. I tested it in our house (2 floors, wooden thick walls and I got very good Wifi coverage also from second floor so that router was in second floor(distance from routes to tablet Pc and Android mobile about 12-15 meters). Coverage and contact is very good. I compared this to product name Netjwork(from Taiwan) and if Netkwork gets 6 points, this gets 9 or 10 points from 10 maximum. I could not get the HUAWEI Dongle E1750 to work on my Android tablet whatever I did. I also got a T Mobile dongle (I am in UK). That was a later HUAWEI Dongle the E173, and that refused to work as well. I spent hours trying to sort it out, to no avail. I saw this on the website, paid the DHL fees to Cornwall in UK, and it arrived 40 hours after leaving chinavasion. Plugged it in, took five minutes to configure, went into a 3G area and connected immediately. T Mobile charge £20 for the dongle, plus £10 for airtime. Its £2 a day for single day use to connect. They also have Euro packages, and as I am going to Italy later in the year, thats extremely useful. The Hotel I am staying at in Rome offer WiFi for guests at 1 Euro a minute (Almost a pounds a minute). Its the smartest mobile gadget I have ever seen to connect on the move to an Android tablet at a very reasonable cost. Thanks again chinavasion, you have succeeded yet again. And the DHL tracking system, whilst dearer than the regular postal service, is worth every single penny. Its brilliant.